As we confirmed in Episode 63 this week, Microsoft’s next generation console, Xbox One, will not* support used games. *Note – Although technically they’re pushing this off on developers, Microsoft does not want you playing a used game. * What we did find out is that Microsoft wants you playing new games for the Xbox One. Microsoft claimed at E3 to have “more titles in development now than in any time in Xbox history”, and announced about a dozen of them; the majority of the titles being Xbox One exclusives. Some major footage was revealed from the upcoming Metal Gear Solid installment, and even though it circulated on Twitter for a while, Major Nelson confirmed this is NOT an Xbox Exclusive. Up next, Xbox One exclusive Ryse, which looks to be a gladiator style sword fighting game. It’s being developed by Crytek, makers of the Crysis series, and will be a launch title. One of the brighter points of Microsoft’s reveal today was the Xbox One Exclusive revival of Killer Instinct! Ultra Combo! Insomniac Games, the team behind the beloved Ratchet and Clank series, is heading production of game titled Sunset Overdrive. It’s like Ratchet and Clank meets Bioshock Infinite; the graphics look alright. If you love mech shooters be sure to check out Titanfall, from former Call of Duty makers, Respawn. It looks and feels like Call of Duty, with a slight blend of Halo. One of today’s bigger reveals was Forza Motorsport 5, featuring one of the only two McLaren P1’s in existence. “Driveatar” is the major new feature in the upcoming Forza release, which utilizes a cloud-based system that learns how you drive, so that your friends and others can “play” against you while you are offline. Once again we saw no actual gameplay footage of Quantum Break, the sci-fi time-freezing game mentioned at the Xbox One reveal last month. Oh yeah….you’re also getting an Xbox One Exclusive version of Minecraft. Two games ended up being quite a surprise as Dead Rising 3, and the artfully-epic RPG The Witcher 3: Wild Hunt was revealed as Xbox One Exclusives. TW3:WH boasts an impressive 100+ hours of gameplay. Quite unsurprisingly, the next iteration of Halo was revealed. According to Microsoft its “A Halo FPS for a new generation of hardware.”; or as we call it, Halo 5. The biggest surprise of the day actually had nothing to do with Xbox One, as a new version of the Xbox 360 was revealed. “It’s smaller and sleaker,” says Microsoft; “You’ll probably need to buy a new one now for when your old one craps out and you don’t want to buy a Xbox One”, says us. You decide. But it all comes down to price. In a surprising move (or NOT if you listen to our podcast), Microsoft announced that Xbox One will sell in the US for $499, and begins taking preorders today ahead of the November 30th launch date. For a console that doesn’t play used games, requires an always-on internet connection, and additional Kinect hardware, this is a very steep price to pay for a next-generation media device. That’s basically it for the recap of Microsoft’s E3 2013 announcement. Oh yeah….and Dark Souls 2. What do you think about the Microsoft announcement today? 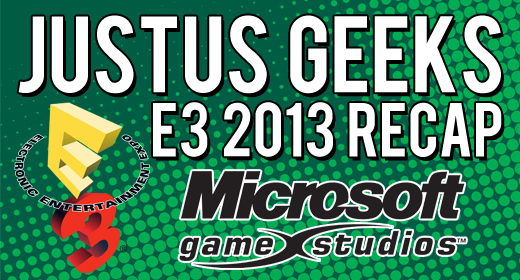 Let us know on Twitter: @JustUs_Geeks or leave us a message on the JustUs Geeks Hotline: 1 (707) OK-GEEKS.